On a recent visit to Toronto and the Art Gallery of Ontario (AGO), I was moved by the presentation of three films by the filmmaker Yael Bartana in the AGO’s Lind Gallery. Her latest film trilogy …And Europe Will Be Stunned features three short films that were made between 2007 and 2011 – Mary Koszmary (Nightmares), Mur i Wisza (Wall and Tower), and Zamach (Assassination) – that are currently on view for the first time in Canada. Yael Bartana, Mary Koszmary (Nightmares) – (still), 2007. Super 16mm film transferred to video (colour, sound, 10:50 mins). 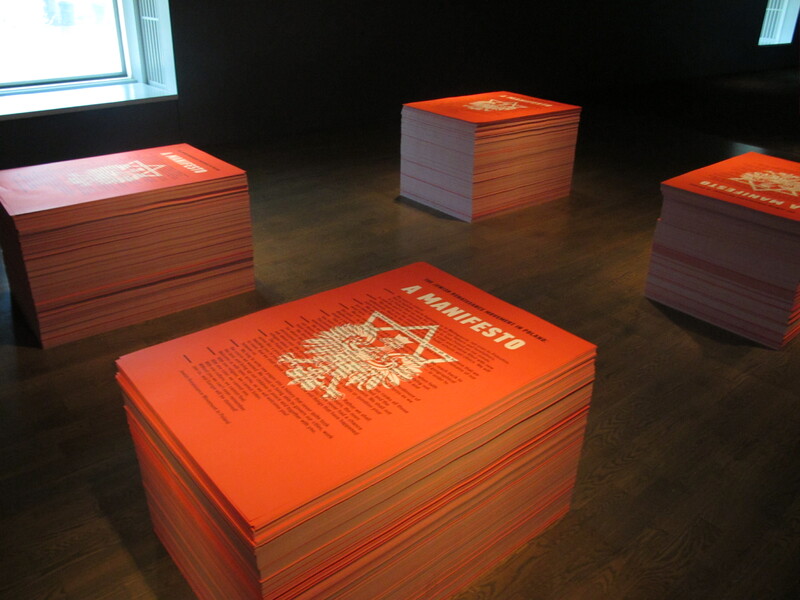 Courtesy of Annet Gelink Gallery, Amsterdam, and Foksal Gallery Foundation, Warsaw, produced with support from Hermès. © Yael Bartana. …And Europe Will Be Stunned tells the fictional story of the Jewish Renaissance Movement in Poland, which takes place at no specific time, but suggestive of the near future. 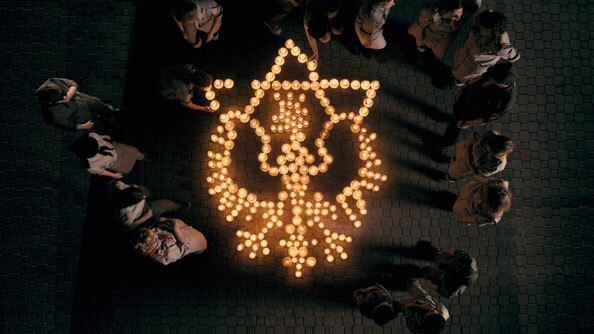 The first film, Mary Koszmary (Nightmares), made in 2007, explores the complex relationships between Jews, Poles and other Europeans in our current age of globalization. The leader of the Jewish Renaissance Movement is shown delivering a speech, urging three million Jews to return to Poland. Yael Bartana, Mur i Wieza (Wall and Tower) – (still), 2009. RED transferred to HD video (colour, sound, 15:00 mins). Courtesy of Annet Gelink Gallery, Amsterdam, and Sommer Contemporary Art, Tel Aviv. © Yael Bartana. 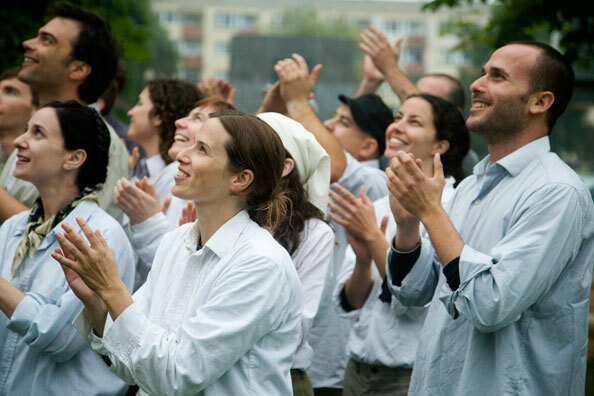 The second film, made in 2009, shows the active creation of a new kubbitz (a communal settlement), reminiscent of the socialist propaganda films of the 1930s and 40s. 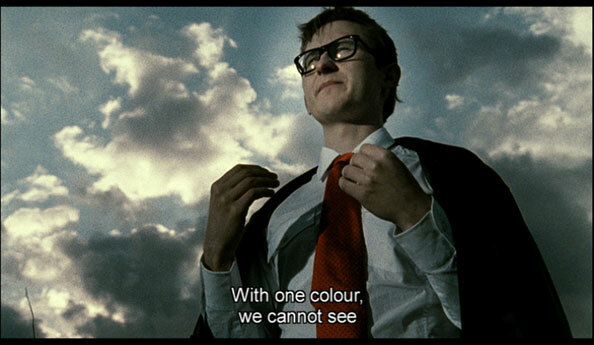 Yael Bartana, Zamach (Assassination) – (still), 2011. Red transferred to HD video (colour, sound, 35:00 mins). Courtesy of Annet Gelink Gallery, Amsterdam, and Sommer Contemporary Art, Tel Aviv. © Yael Bartana. The third and last film of the trilogy shows a funeral ceremony for the leader of the Jewish Renaissance Movement, who has been mysteriously killed by an unidentified assassin. His symbolic death is shown to unite the myth of this fictional political movement, and through it, the possibility for a multinational community. As I moved from room to room from the first film to the last, I was entranced by Bartana’s attention to detail in the construction of her narrative. Bartana expertly mixes imagery reminiscent of the historical past with the present, and raises questions of identity and belonging, leaving us to pause and question our own concepts of home and homeland. In raising these questions regarding the complexities of cultural integration, interwoven with reality and fiction, her films challenge us to question our own understanding and acceptance of historical events. I was, in a word, stunned. The film was commissioned by Artangel, Outset Contemporary Art Fund, Louisiana Museum of Modern Art, the Netherlands Foundation for Visual Arts, The Netherlands Film Fund and Zachęta National Gallery of Art, Warsaw. …And Europe Will Be Stunned is on view at the Art Gallery of Ontario until April 1, 2012.